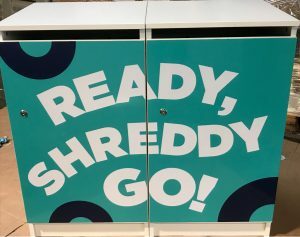 We are delighted to be the only shredding company in Scotland to offer a bespoke wrapped cabinet service, where you can have your shredding cabinet wrapped in any design, logo or colour. One of our customers, The Mortgage Lender based in Glasgow city centre, asked for their new cabinets to be wrapped with their branding and some quirky phrases. We think these cabinets look amazing and will certainly attract attention in their office.